I love cherry pie. 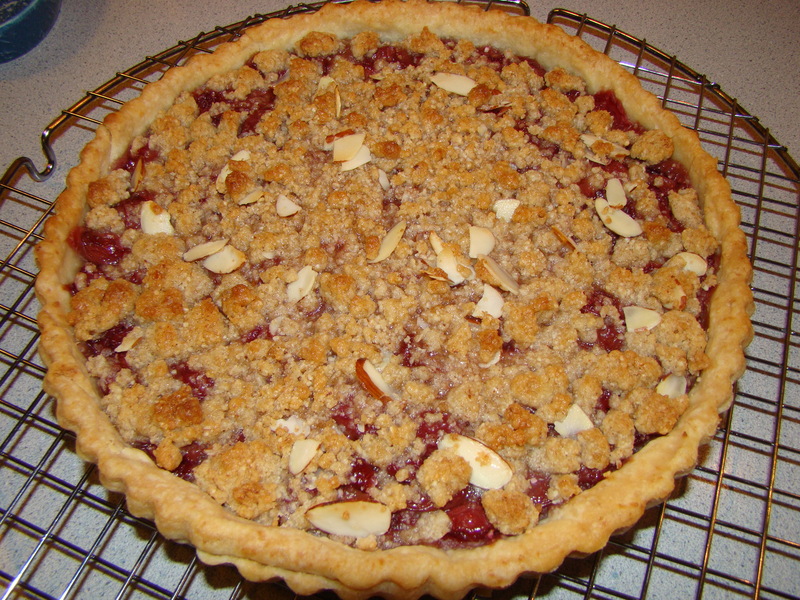 Usually, I make just one cherry pie (tart, actually) each year in July, when the sour cherries are in season. This past summer, Howard brought home cherries from the farmer’s market a second time. We pitted them and froze them and saved them for a winter treat. I think of cherry pie as something for George Washington’s birthday, though they now say he never did chop down that cherry tree. I really enjoy making tarts. I prefer making tarts to pies. They aren’t all that different as far as the ingredients go. I think one of the reasons why is that a tart looks more elegant, standing without support it comes out of the pan (with removable bottom). I have one of those glass-domed cake dishes, like they have at a diner. A tart looks very special under the glass. Also, tarts take less filling than a pie. That means you can have the treat of a slice of the tart for dessert, but it’s a smaller piece, so less decadent, than a slice of pie. I mastered any fear of making of making pastry crust years ago with the help of Julia Child and the food processor. I’ve recently changed the actual recipe from Julia’s because hers used a few tablespoons of Crisco to “tenderize American flour”. Now that I’ve banned transfats from my diet, I make an all-butter crust, which is working out just as well. I still use the technique I learned from Julia. Roll out the pastry and place in a 9-inch tart pan with a removable bottom. I fold the overhang back into the pan and press to the sides to strengthen the shell. Prick the bottom of the crust with a fork and place in the freezer for 30 minutes. Bake in a preheated 450F oven for 15 minutes. Remove the foil liner. Prick the bottom again if it has puffed up. Bake 10 more minutes without the foil, until lightly golden. Combine the cherries, sugar, tapioca, and ½ cup crumble topping. Fill the tart shell with the cherry mixture. Sprinkle the remaining crumble on top (remember, you are only using half the crumble topping). Bake for 30 minutes until topping is lightly brown and filling is bubbly. This recipe only uses half of the Marzipan Crumble topping. Freeze the other half for another dessert. You can try a half batch of the apple crisp in my post for Accidental Apple Crisp. Another food holiday we always try to observe is Mardi Gras because I love the food from New Orleans. We visited the city, pre-Katrina, in December 1994. We enjoyed staying in the French Quarter, breakfasting at the French Market, browsing the antique stores on Magazine Street, and visiting the Garden District. The National Park Service offered great tours as New Orleans is considered a National Historic Site. We even happened upon a house tour in the Garden District, so we were able to visit 3 or 4 private homes. The food was amazing, and there can’t be anywhere in the world quite like Bourbon Street. I am not a big drinker, but you’ve got to love a place where the bars along the street are mostly take-out. I don’t remember seeing many places where you could sit down and enjoy a drink. It was more like drink-and-stroll. It still makes me laugh to think about it. One of the reasons we bypassed the Louisiana chili for the Super Bowl last week was because Mardi Gras was right around the corner. 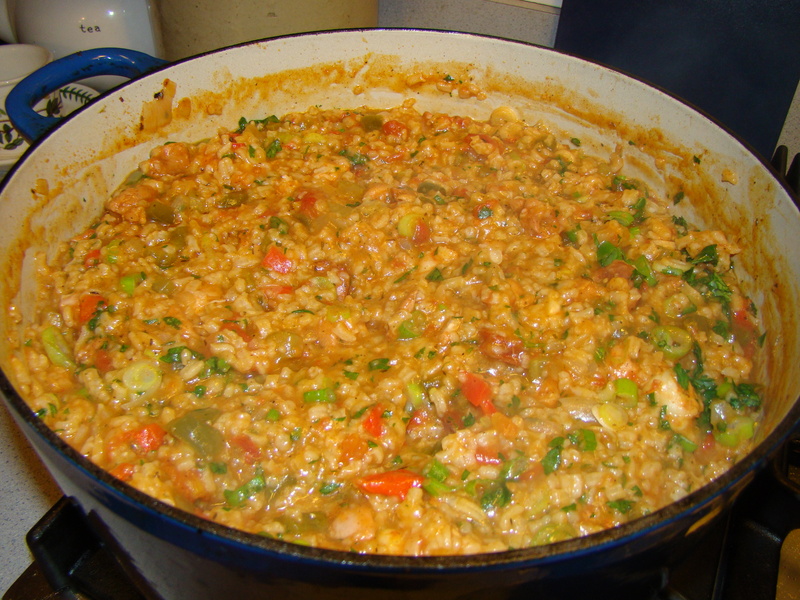 I’ve made many different recipes for jambalaya, and it seems to be a no-fail dish. I mentioned to my sister Jane what I was thinking of making. She sent along her recipe, which originally came from an Emeril Lagasse cookbook. She’s made some modifications, and I made some of my own. Toss the chicken with 2 Tbsp Emeril’s Essence. Heat the oil in a large heavy pot (I use my Le Creuset Dutch oven). Add the chicken pieces, and cook for 5 minutes, until lightly browned. Remove chicken from the pot and set aside. Add the sausage to the pot (add more oil if it’s dry), and cook, stirring until browned, about 5 minutes. Add the onions, green pepper, red pepper, celery, salt, cayenne, and pepper. Cook, stirring often, until the vegetables soften, about 5 minutes. Add the tomatoes, garlic, and bay leaves. Cook about 2 minutes. Add the rice, and, cook, stirring for 2 minutes. Add the thyme, stock/tomato liquid, and cooked chicken. Bring to a boil. Reduce the heat, and cover the pot. Simmer, stirring occasionally, until the rice is tender. Not all of the liquid will be absorbed. Toss the shrimp with the 1 Tbsp Emeril’s Essense. Add the shrimp to the pot and stir. Cook until the shrimp turns pink and is opaque, about 5 minutes. Remove the pot from the heat, and let it rest, covered, for about 15 minutes. Gently stir the scallions and parsley into the jambalaya. Remove and discard the bay leaves.